So that’s how I ended up walking, with a nice man from the hotel, to the tourist bus station in Kathmandu. I was nervous, numb, and distracted over whether my placement would be the kind of thing I hoped for. Mostly I was just lonely. I was lonely for home, but also for the people I’d met in my week of training: other volunteers, Emma in office, the lovely village of Godawari where I stayed for four days with my language teacher Krishna didi. I thought about Asmita, the 12-year old neighbor in Godawari; her photo was tucked away in my bag. After just one and a half weeks it seemed like I’d already been far from home for a long time, and these were the things that had come to be comforts. With that intensity that’s unique to homesickness, I was profoundly sad to be leaving these safeguards now too. I threw my things to a guy on top of a bus and chose a cramped window seat inside. I always like the cramped window seat better than lopsided aisle seats, where all the space on one side makes me feel off balance. Better to just be crowded in on all sides. I assumed my normal posture: a ball, knees resting at chin level on the seat in front of me. The bus waited to leave. I waited to leave. I wondered what I’d forgotten to bring with me. I did eventually find the green towels. I had both of the ill-fitting kurta salwars I’d had sewn during my training—thank goodness for those, they make me feel like a cheerily clad elephant, and I’m sure will help me blend in. I had the apples and chocolate I’d purchased as a gift for my host family. Who will they be? I had dried fruit (keeps you regular). I had my digital audio recorder, biodegradeable shampoo, and biking shorts to wear under a skirt. I had no idea if I would use these things, and I had no skirt. I had a pair of flip-flops I’d bought on the street, and I knew I would use those. I had the dorky bean-stuffed lion Mom and Dad gave me when they left first left me at college—I’m a leo and the Dorky Lion’s name was Leo. I missed Mom and Dad, and the pantry with raisin bread in it, and Asmita, and that nice guy from the hotel who dropped me off five minutes ago. I wondered how I was going to communicate without Krishna didi. Two months isn’t so long, anyway. Two months isn’t long enough. There is not a single bagel in the entire nation of Nepal. Then, in a moment sudden and unbidden, as I looked out the window onto the sepia street, a fall of serenity landed over me like a velvet mist. Immediately I latched onto it, trying to expand it, find its source, make sure it was real, to be sure it would last. But just as suddenly, I realized I could neither understand this moment of comfort, nor keep it. 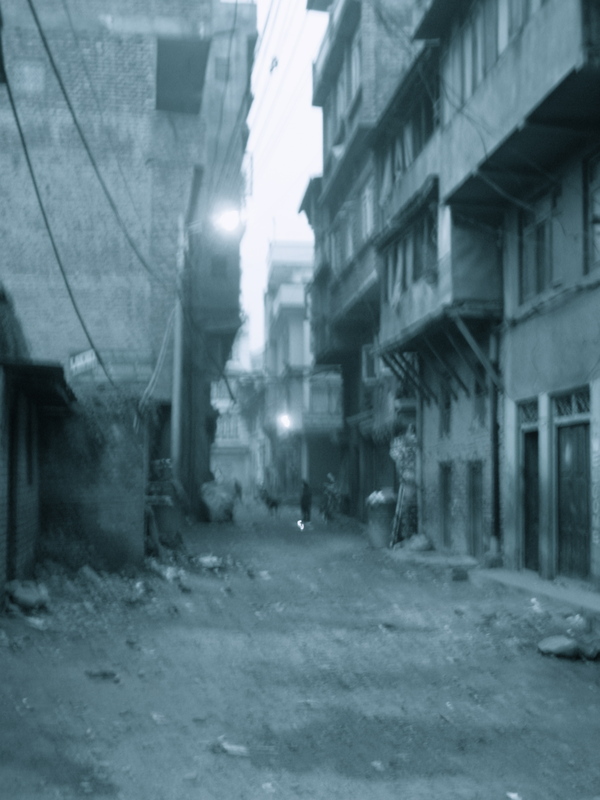 I simply stayed still for that instant, looking at the washed out yellow light slanting onto Kathmandu’s gritty buildings, washing dawn away into morning, feeling peace with no identity. And then it is gone, like so much creek-water slipping over the sitting stone.